Between a Rock and a Hard Place! is a 1985 Masters of the Universe mini-comic written by Tina Harris and Jim Mitchell and illustrated by Mitchell and Tom Luth. Here, Evil-Lyn sells out to Hordak, who launches an assault on Castle Grayskull. The pages before the comic turns into a big fight scene are quite good, and while the comic is reasonably well done, there are some annoying niggles with how this story is put together. He-Man’s dialogue doesn’t always ring true. The Mantisaur cannot tell time. Orko flying is, apparently, an impressive magic trick these days. 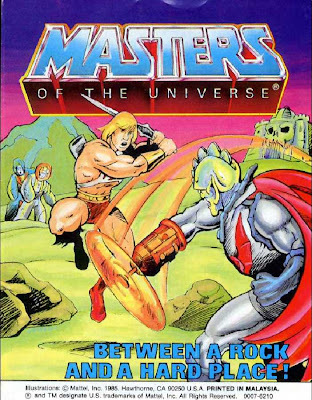 And the Power Sword is getting directly involved in the action with powers we haven’t ever seen before (and if the sword can return to He-Man whenever he needs, why is he upset about dropping it?). The art is a plus (certainly it’s noticeably better inside than on the slapdash cover), and the opening page is a highlight. The artists do a particularly nice job with faces, especially Evil-Lyn’s. The inks are a little light on details at times, but the shaded coloring helps make up for it. The sword having boomerang powers is pretty hard to forgive, but on the strength of the setup and the art, this is a solid enough mini-comic.